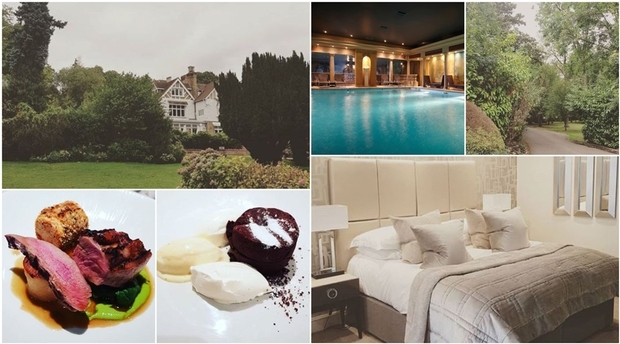 Head of Social Media, Kay Tilbury, shares all the details of her blissful stay at the beautiful Rowhill Grange Hotel & Utopia Spa. I was delighted to be invited to enjoy a relaxing stay the award-winning Rowhill Grange Hotel & Utopia Spa – this luxury wedding venue provides the perfect backdrops should you wish to tie the knot there or offers a romantic getaway for you and your beau pre- or -post wedding. Nestled in the Kent countryside lies the beautiful boutique hotel, as you turn into the driveway you are instantly presented with an inviting glorious garden. As we arrived there was a wedding taking place, which looked stunning amongst all the greenery. Friendly staff welcomed us and showed us to our junior suite – the spacious room featured modern muted palette décor, a large plasma TV, hospitality unit and a luxurious opulent bathroom with a oversized bath and walk-in rain shower. The suites are perfect for a relaxing night away together. Soft robes and comfy slippers were waiting for us in our room, ready for the Utopia Spa – the hotel has a relaxed feel that allows guests to walk around and enjoy a drink in the spa's bar area whilst in their robes - It didn't take us long before slipped them on and headed down for some R&R. The warm-lighting and Roman-inspired interiors transported you to a heavenly state of relaxation. Boasting a hydrotherapy pool, Jacuzzi, swimming pool and relaxation lounge there is oodles to help you unwind from every day stresses. We indulged in some fine dining at the hotels restaurant. For my main I opted for the Saddle of Lamb; buttered spinach, fondant potato & chicken mousse, followed by a delicious dessert of the warm chocolate fondant topped with vanilla ice cream. Foodies will love the creative menu this restaurant boast. After our perfect dinner-date we enjoyed a cocktail - or two ;) - in the stylish bar & lounge area. Our joyous stay was ended with a wonderful nights sleep in the super-comfortable bed and full English breakfast delivered to room the next morning. We left feeling refreshed and relaxed. If you're interested in booking your big-day here, don't miss out on it's wedding show on Sunday 11th November, 2018. Wedding coordinators who will be on hand on the day to offer show-rounds, answer questions and help bring your dreams to life. You will also have the opportunity to meet with our recommended suppliers.